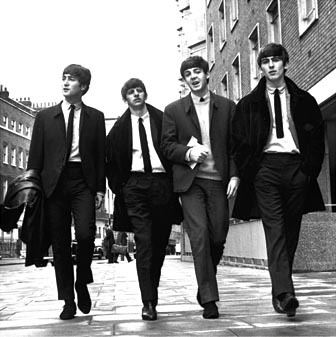 John Lennon, Paul McCartney, George Harrison and Ringo Starr are four young men from Liverpool. They share a love of America's new music: rock and roll. 1940 July 7 Richard Starkey is born in Liverpool. He later changes his name to Ringo Starr. Oct. 9 John Lennon is born in Liverpool. 1942 June 18 Paul McCartney is born in Liverpool. 1943 Feb. 24 George Harrison is born in Liverpool. 1956 John Lennon starts a skiffle band. He names it after his school, Quarry Bank High. 1957 Paul McCartney befriends a young guitarist on their bus journey to school. July, 1957: John Lennon’s school band, The Quarrymen, play a local summer fete. Fifteen-year-old Paul McCartney is also there - in search of girls. John and Paul meet for the first time (see video/read text). Soon after Paul joins the group. December: Paul arranges for the 14 year-old, George Harrison to audition for John - also on the top of a bus - see here. John asks George to play Raunchy - a popular guitar song at time. George is ‘note-perfect’. Reluctantly John is agrees for George to join the band. Who was the tallest Beatle? Why did the Beatles stop performing live? We were the best live band in the world before we were famous. Nobody could touch us John Lennon. When did George Harrison stop taking LSD? Why? Did Bowie cover any Beatles songs? Why was the Walrus Paul'? Why did The Beatles sack Pete Best?